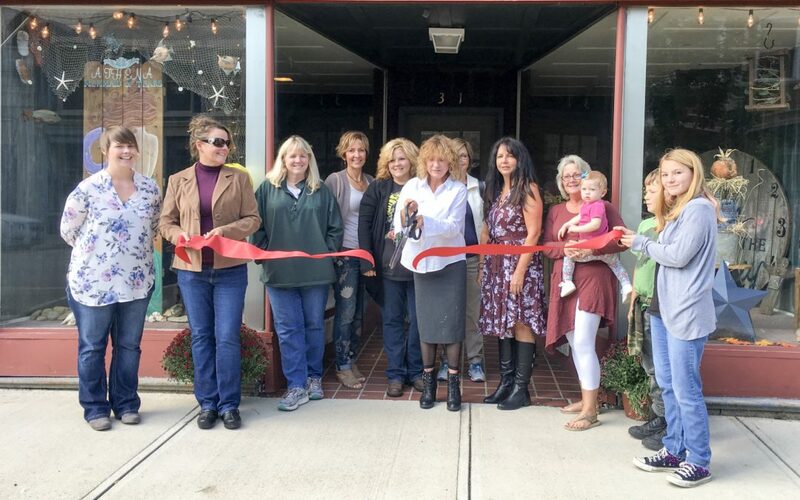 The Wilmington-Clinton County Chamber of Commerce celebrated an open house and ribbon cutting for the grand opening of Athena on Friday, September 8th. Athena is located at 31 West Main Street in downtown Wilmington. ” My name is Tanya Mincer, and I am the owner of Athena (Mermaid of Tears, LLC). My store is lovingly named after my dog, Athena. As a child, I always told my mom I was going to be an artist. My vision for this store began about 35 years ago in my garage. I was about 17 when I began building things and selling them. My goal was always to have a store of my own and to help other artists along the way. I have a couple different artists working with me currently. One of my artists is Tracy Harrison, a stay at home mother of four. She’s done various art and candle-making for about 25 years. Cynthia Lane is an artist here also. She has been doing art and building with me since I met her 5.5 years ago. You will find a variety of handmade things in my shop, some of which are furniture, home and yard decor, seasonal items, jewelry, and much more – even zombie babies! For more information about Athena, visit their Chamber profile (CLICK HERE).